The design will be on display for public till November 7. The 3D design clearly locates as to which facility or project comes within which limits of the villages. A team of officials from Singapore who are associated with urban planning and the Amaravati City Master Plan-2050 have left an indelible mark among farmers. 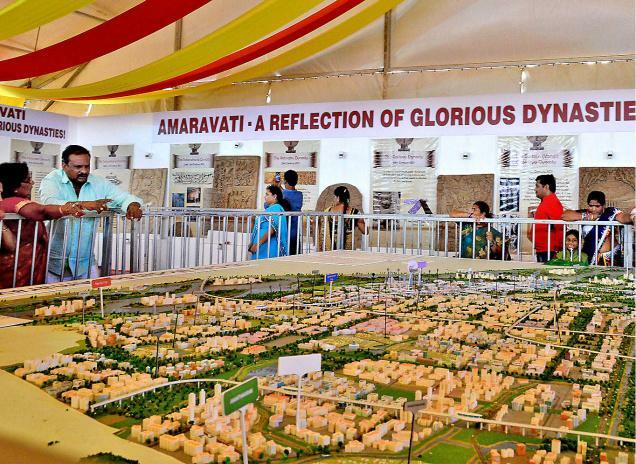 The experts from Singapore have prepared a 3D design of the Amaravati capital region, including the Seed Development Master Plan, which was kept on display at the foundation ceremony venue. It will remain open till November 7. “The farmers who parted with their lands for India’s first planned river-front city are spending most of their time here, identifying land marks,” said N. Durga Prasad, a senior official. The 3D design clearly locates as to which facility or project comes within which limits of the villages. The design also presents a clear picture on the areas where the Assembly, Secretariat, Ministries, State Gallery, Canal parks and other facilities have been proposed. In the water body areas falling within the capital region, the design shows the proposed projects such as wetland park, jetty downtown and downtown core. The entire 3D design has 27 components, which cover the entire Amaravati City Master Plan and Capital Region as well. “I am observing the design. I need a few more days to have an idea about the capital. The design is an easy way to understand what the government plans to build and how it is being planned,” Koyagura Ramesh, a farmer, said. Mr. Ramesh had parted with 75 cents at Nelapadu for the capital. The curiosity to know more about the their land that was given for Amaravati has been drawing farmers within the capital region, as the design directly connects to their lives. “Many farmers are bringing their entire family members to have them realise that their land is being used for some facility in Amaravati. However, each farmer is attempting to take a picture with the design,” said a police officer. However, the maps of the capital city and region are also made available for visitors for ready reference on any site.